John Coomer, of Overland Park, Kan., says he was injured at a September 2009 Royals game when the team's lion mascot, Sluggerrr, threw a 4-ounce, foil-wrapped wiener into the stands that struck his eye. The Jackson County jurors who first heard the case two years ago sided with the Royals, saying Coomer was completely at fault for his injury because he wasn't aware of what was going on around him. If it had been a foul ball or broken bat that struck John Coomer in the eye as he watched a Kansas City Royals game, it's unlikely the courts would have forced the team to pay for the surgeries and suffering he's endured. But because it was a hot dog thrown by the team mascot — behind the back, no less — he just may have a case. The Missouri Supreme Court is weighing whether the "baseball rule" — a legal standard that protects teams from being sued over fan injuries caused by events on the field, court or rink — should also apply to injuries caused by mascots or the other personnel that teams employ to engage fans and justify steep ticket prices. Because the case could set a legal precedent, it could change how teams in other cities and sports approach interacting with fans at their games. Coomer, of Overland Park, Kan., says he was injured at a September 2009 Royals game when the team's lion mascot, Sluggerrr, threw a 4-ounce, foil-wrapped wiener into the stands that struck his eye. He had to have two surgeries — one to repair a detached retina and the other to remove a cataract that developed and implant an artificial lens. Coomer's vision is worse now than before he was hurt and he has paid roughly $4,800 in medical costs, said his attorney, Robert Tormohlen. Coomer, 53, declined to discuss the case. His lawsuit seeks an award of "over $20,000" from the team, but the actual amount he is seeking is likely much greater. Tormohlen declined to discuss the actual amount. The Jackson County jurors who first heard the case two years ago sided with the Royals, saying Coomer was completely at fault for his injury because he wasn't aware of what was going on around him. An appeals court overturned that decision in January, however, ruling that while being struck by a baseball is an inherent risk fans assume at games, being hit with a hotdog isn't. The state Supreme Court heard oral arguments last month, but didn't indicate when it might issue its ruling. Few cases had addressed the level of legal duty, or obligation, a mascot owes to fans, so Coomer's case is being closely watched by teams throughout the country, said Tormohlen. "If a jury finds that the activity at issue is an inherent and unavoidable risk, the Royals owe no duty to their spectators," Tormohlen said. "No case has extended the no-duty rule to the activities of a mascot." The Royals, whose spokesman declined to comment on the case while it is pending, have argued that the hotdog toss has been a popular fan attraction at Kauffman Stadium since 2000 and is as much part of the game experience as strikeouts and home runs. From mascot races and T-shirt cannons to free Wi-Fi and stadium sushi stands, teams have been doing everything they can to convince fans that the live experience is worth the high ticket and concession prices and is better than watching games on television. "You have this competition with teams engaged in pushing the envelope trying to make the experience at the event better than what you can experience at home," said Jordan Kobritz, a professor in the Sports Management Department at SUNY Cortland. "You also have the fan mentality in which risk today is more tolerable than it's been in our history." A ruling in Coomer's favor, or one that at least assigns partial blame to the mascot, could force teams to rethink their promotions, or at least take additional measures to keep spectators safe, Kobritz said. Bob Jarvis, a sports law professor at Nova Southeastern University in Florida, said a 1997 California case set an important precedent when a state appeals court ruled that mascots are not an essential part of a baseball game. In that case, a minor league baseball team's dinosaur brushed against a fan, distracting him right before he was struck by a ball that broke several bones in his face. The court said mascot antics aren't essential or integral to the playing of a game. Furthermore, not all courts have treated the baseball rule as sacrosanct. Earlier this year, the Idaho Supreme Court allowed a fan who lost an eye to a foul ball at a minor league baseball game to proceed with his lawsuit against the team. The court said that since baseball fan injuries are so rare in Idaho, there didn't seem to be a compelling reason for the court to step in. 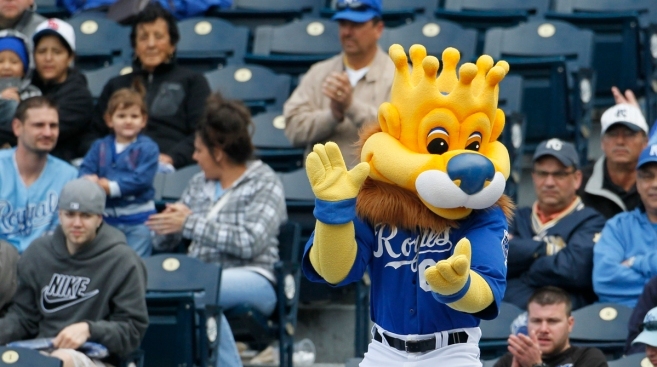 In the Kansas City case, a ruling in the Royals' favor would indicate that mascots are, indeed, an essential part of the game experience, Jarvis said. If that happens, the Kansas City case would likely supplant Lowe's as the one attorneys look at when deciding whether to file a lawsuit on behalf of an injured fan. "If you could get a court to go the other way and say in-game entertainment is a natural part of playing baseball in the U.S. in the 21st century, that would be a tremendous precedent that could cut off future lawsuits," Jarvis said.